M. Markl, A. Müller, N. Ritter, M. Hofmeister, D. Naujoks, H. J. Schaar, K. Abrahams, J. Frenzel, A. P. A. Subramanyam, A. Ludwig, J. Pfetzing-Micklich, T. Hammerschmidt, R. Drautz, I. Steinbach, R. Rettig, R. F. Singer, C. Körner. The development of new Ni-base superalloys with a complex composition consisting of eight or more alloying elements is a challenging task. The experimental state-of-the-art development cycle is based on the adaption of already existing compositions. 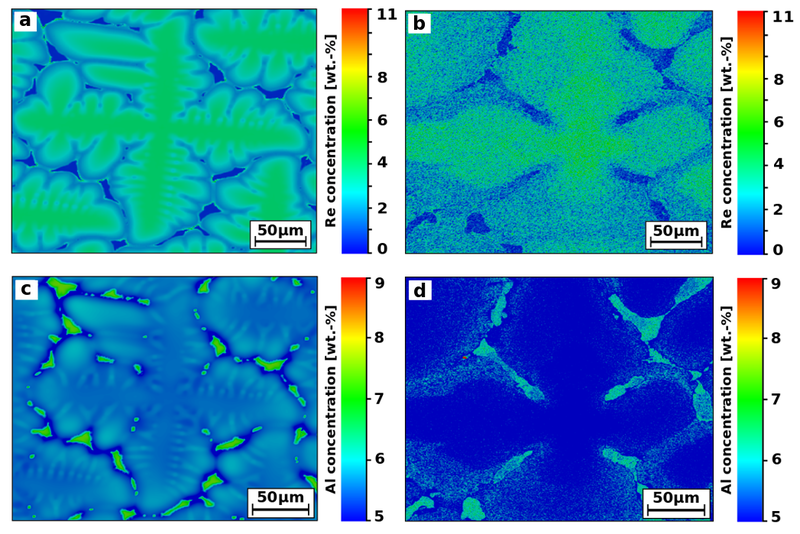 Although new alloy compositions with potentially improved material properties are expected to be similar to already known superalloys, this procedure impedes efficiently finding these compositions in the large multi-dimensional design-space of all alloying elements. Modern alloy development combines numerical optimization methods with experimental validation to guide the development towards promising compositions. In this work, an improved numerical multi-criteria optimization tool using CALPHAD calculations and semi-empirical models for alloy development is presented. The model improvements to its predecessor are described and the successful application for the development of rhenium-free single-crystal Ni-base superalloys ERBO/13 and ERBO/15 is revisited. The optimization tool is described and the designed alloys are discussed regarding phase stability. Finally, a possible phase stability model extending the optimization tool and improving the alloy composition predictions is presented.